Driver Tonic is the ultimate tool for your Windows PC. It consists of Registry Cleaner and Driver Updater which keeps your PC running like a new one. With Driver Tonic, you can enhance the performance of your system in the most efficient manner. Driver Tonic: Ultimate Utility to Update System Drivers. Experience an enhanced PC by updating all your system drivers with Driver Tonic. The utility quickly finds your outdated or missing drivers and lets you update them instantly in a single tap to give you a smooth PC experience always. Potential errors may arise in your system when a driver becomes obsolete or incompatible. 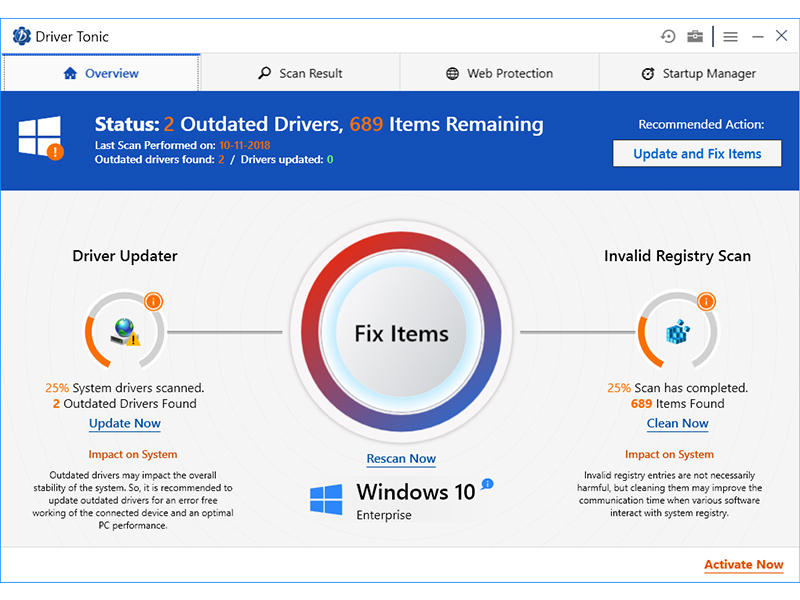 The Driver Updater feature scans your PC for all the outdated, missing or corrupt drivers and lets you install the latest drivers from a single platform so as to reduce hardware problems&improve PC performance. Invalid registries are not necessarily harmful but cleaning them may improve the communication time when various software interact with system registries. Driver Tonic lets you clean these invalid registries in a single click. Driver Tonic provides browsing safety to its users with its Web Protection feature. It prevents malware infections by blocking vulnerable websites and downloads for you. Driver Tonic supports complete browser protection on major browsers like Chrome, Firefox&IE. Update all types of outdated drivers on your system from a single utility to reduce hardware problems&enhance PC performance. Driver Tonic can solve all your drivers and registry issues to improve the performance of your Windows PC and keep it running like a new one. It is the perfect partner for your system. Cleaning all the invalid registries can solve registry errors and highly improve your system response time. When you enable this feature, you can enhance your web surfing experience by blocking the vulnerable websites on all major browsers. Improve the startup time of your system by managing and removing unwanted items present on your Startup menu. Multifunctional system tray utility. It includes a multilevel Launchbar, Programmable Macro Hotkeys, Screen Highlighter, Color Picker, Screen Magnifier, Character map. These utilities can make your daily work a lot easier. SpeedyFixer is a top-ranking error-resolution and registry cleaner which will fix the pc errors and optimize the windows settings.